(Nanowerk Spotlight) The huge economic impact of the corrosion of metallic structures is a very important issue for all modern societies. Estimates for the cost of corrosion degradation run to about €200 billion a year in Europe and over $270 billion a year in the U.S. The annual cost of corrosion consists of both direct costs and indirect costs. The direct costs are related to the costs of design, manufacturing, and construction in order to provide corrosion protection, and the indirect costs are concerned with corrosion-related inspection, maintenance and repairs. A few years back we ran a Nanowerk Spotlight ("Self-healing nanotechnology anticorrosion coatings as alternative to toxic chromium") that reported on a novel method of multilayer anticorrosion protection including the surface pre-treatment by sonication and deposition of polyelectrolytes and inhibitors. This method results in the formation of a smart polymer nanonetwork for environmentally friendly organic inhibitors. The team, led by Dr. Daria Andreeva, a Research Associate at the University of Bayreuth, together with researchers at the Max Planck Institute of Colloids and Interfaces in Golm, Germany, has now developed a novel and effective system for metal protection against a wide range of biological and chemical aggressive agents. "In comparison with other metal protection strategies and encapsulation techniques, our concept of construction of metal protective system has significant advantages" Andreeva tells Nanowerk: "First, the capsule layer is adhered to the metal surface, thus, we can overcome the problem of homogeneous distribution of encapsulated active agents along the surface; second, our surface capsules are universal encapsulation system suitable for a wide range of compounds; and third, the surface capsule layer is friendly to traditional coating technologies (due to its roughness, surface composition, solvent and temperature resistant) providing excellent adhesion of the traditional coatings for metal protection." Reporting their findings in the January 9, 2012 online edition of Small ("Nanoengineered Metal Surface Capsules: Construction of a Metal-Protection System"), the team presents a novel encapsulation system based on a sonochemically formed porous metal layer, which is continuous with the bulk metal – i.e. it doesn't have to be immobilized on the material's surface or be incorporated into a protective coating layer. Specifically, the approach relies on sonochemically formed surface metal sponges that adhere to the bulk metal. These metal sponges can be loaded with all kinds of agents such as corrosion inhibitors, biocides, enzymes, DNA fragments, antibodies, etc. The ultrasound treatment used by the researchers is a fast and environmentally friendly method. It is performed in aqueous solution and could potentially be applied to large surfaces. Thus, ultrasound could replace some expensive, multi-stage and time-consuming methods of surface engineering. Although upscaling still is an issue: Sonication of large areas of metal plates requires the fabrication of special ultrasound devices – large sonotrode areas or a series of sonotrodes. Effects of ultrasound on solids are based on acoustic cavitation. As Andreeva explains, the collapse of cavitation bubbles generated by ultrasound is followed by high local (square micrometer area) temperature (up to 5000 K) and a high rate of heating/cooling switch. The system remains macroscopically near room temperature and ambient pressure. Thus, ultrasound provides special casting conditions for metals and affects the metal microstructure. "The collapse of the cavitation bubble at the metal surface has a mechanochemical effect: breakage of the initial oxide layer and plastic deformation of metal and sonochemical effect – oxidation of metal surface by sonogenerated free radicals," explains Andreeva. "Thus, the 200 nm thick surface layer is transferred into mesoporous surfaces sponges. The surface sponges – we call them 'surface capsules' – are a system of cavities which can be used for encapsulation of active chemicals. A comparable metal storage system requires a very intricate synthesis of materials using nanostructured templates." This technique, for the first time, provides a new and inexpensive approach for the formation of surface capsules with high loading capacity, high stability, and high adhesion to the metal matrix. These new findings illustrate how chemists, with their knowledge of how to modify surfaces, can help biologists and clinicians control cell behaviors and certain components delivery into organisms. In future, such surfaces could become useful for the development of new medical therapies, such as growing organs and tissues, and for the fabrication of implants. 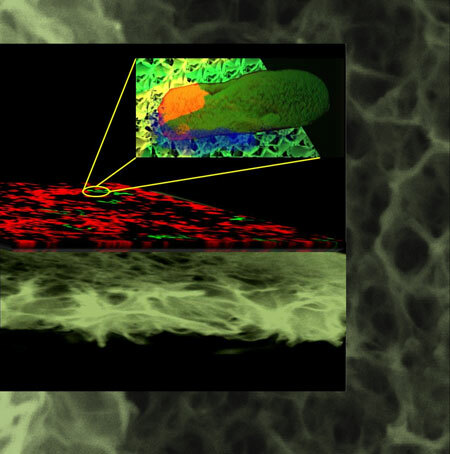 The team is planning to continue development of their system by creating a method to control the behavior of cells – such as stem cell, bone or cartilage – using soft matter defined micro- and nanopatterned metal sponge surfaces. The surface capsules could be loaded with enzymes, DNA fragments, antibodies and bone morphogenetic proteins, vitamins and drugs. This would allow growing tissue on the sponge surface with the delivery of different compounds into the cells during different growth stages.